By now you know I'm a draft junkie, with the exception of the military draft, I'm all about drafts. NBA, NFL, playground touch football, it's for me and I don't deny it. With the NBA draft looming over the playoffs and the Celtics on an off day, all efforts are diverted to Rose v. Beasley. Gas prices dropping below $3.00 a gallon and the Chicago Bulls getting the #1 pick overall were equally unlikely three weeks ago. Today, a week after the NBA draft lottery, the Bulls are picking #1 and we here in the Northeast are bordering on paying $4.00 a gallon by weeks end, I would have rathered the reverse but oh well. With the Bulls in the draft drivers seat things have become a little more interesting than we thought they would. Bulls owner, Jerry Reinsdorf, along with general manager John Paxton are left with a very tough decision ahead of them. Given the current landscape in the NBA along with the recent play of all-star point guards Deron Williams and Chris Paul, the Bulls should follow suit right? Maybe not, with Chicago native and Calipari coached, Derrick Rose sitting there it will be very hard for Da Bulls to pass on him. On the other hand, Kansas State phenom Michael Beasley, who has been the wire to wire top player in the 2008 NBA draft class since last October, is also more than qualified for the top pick. So the question remains, who do the Chicago Bulls draft with the top selection? For Derrick Rose, the case is an easy one. 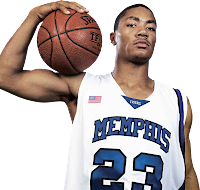 The 6-3 point guard led the Memphis Tigers to an impressive 38-2 record while averaging 15 points and 5 assists a game. In his one year at Memphis, Rose was selected by the AP as a third team All-American whose stock rose (lame pun, I know) after a sensational post season tournament run. Dropping 20 ppg in the tournament, including 25 against UCLA, 27 against Michigan State, and 21 against Texas, three of the tournaments top teams, Rose was dominating. His size (at 6-3 & 205 lbs.) is comparable to NBA all-stars Jason Kidd, Deron Williams, and Chauncey Billups. The downside of the Bulls selecting Rose is that they currently are locked into guard Kirk Hinrich for 36.5 million dollars over the next 4 years, a contract few teams would take on. Adding a guard like Rose to a team consisting of Luol Deng and swing man Ben Gordon could be deadly in the Eastern Conference. Then again . . .
Michael Beasley does exist, and is more than a force to be reckoned with. The first team All-American scored under 20 points only 6 times this season, averaging an amazing 27 points a game in his freshman season at Kansas State. The monster 6-10 forward grabbed 12+ boards a game while shooting .379 from behind the arc. A Bulls team that certainly needs help on the glass would benefit from Beasley's ability to get to the rack. Against Kansas, the eventual National Champion, Beasley averaged 32 ppg and 9 boards, impressive to say the least for a freshman. Paired with the 6-9 Luol Deng, Beasley at 6-10 would be able to dominate inside. The focus on Beasley allows Gordon to get more open looks from Hinrich and gives Joakim Noah room to play like he did at Florida. Problem child, Tyrus Thomas, coming off the bench and Andres Nocioni with his 13 ppg who would be the odd man out gives the Bulls a stronger bench, provided Hinrich stays healthy. At first, I was all over Derrick Rose with this #1 pick, he's a Chicago native with tremendous upside. He gives you strength at the guard spot, capable of scoring in big games, and a quality duo with Ben Gordon. However, at second look Michael Beasley is a can't miss player, an awesome athlete with great scoring ability. The bottom line is the bottom line, you can't move Hinrich and get much in return, with Beasley adding a huge component to the Bulls it may be a no-brainer. Beasley to the Bulls, kudos to my buddies Chandler & Roche for being the first to call it. Nuff Said.